Let's face it – getting kids to do something that's good for their health can be a real challenge sometimes. As if encouraging them to eating their vegetables and take a bath wasn't bad enough, helping them keep up with good oral hygiene can be a game of cat and mouse. Here are a few simple tips to help making brushing and flossing part of your children's regular routine. Learning a new habit takes time and consistent effort. 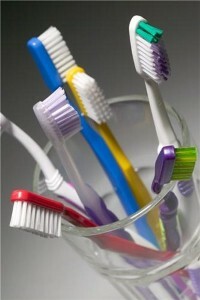 To help reinforce these habits in the morning and before bed, you should make brushing teeth a family event. With everyone taking care of their teeth together on a regular basis, you'll help your little ones continue to practice these habits in the future too. Good behavior is often easier to encourage if there's an incentive for kids to keep in mind. Consider setting up a calendar or chart for kids to mark off brushing, flossing and rinsing twice a day. If they do it for seven days straight, you can offer them a reward at the end of every week – something like a small toy, picking what you eat for dinner or heading out for a fun weekend adventure. One of the biggest reasons kids don't like to brush their teeth is because of the "icky" taste of toothpaste, floss and mouthwash. However, you can make oral hygiene more desirable by finding fun flavors that are more child-friendly. For instance, bubblegum floss and spearmint toothpaste taste much better than plain flavors.